Time to swap out announcements on Elk Grove message billboard, scrutinize city spending? 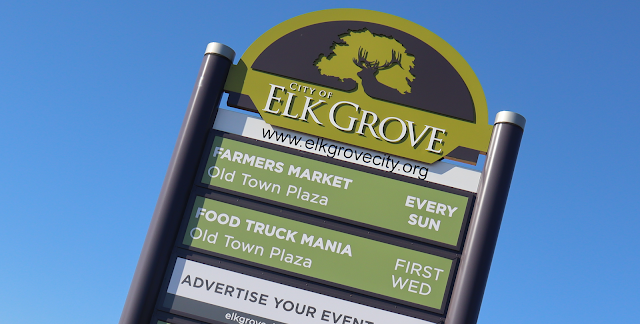 After what seemed like several year processes, earlier this year the Elk Grove City Council approved a plan to place two so-called community message signs at high automobile traffic locations in the city. The two signs, which costs just over $81,000 were fabricated and installed by the Arrow Sign Company of Oakland. Although the city council decided against the more expensive electronic signs, the idea was even in the day of mass information via social media, these billboards were crucial to the residents and for economic development reasons. Following their installation, the signs quickly had information posted about the Cosumnes Community Service District's annual Giant Pumpkin Festival in early October and the city-sponsored Veterans Day Parade planned for November 11 (see video below). Along with those two events, the city has seemingly placed on a permanent basis placards advertising the weekly Sunday farmers market in Old Town and the monthly food truck event, also in Old Town. Interestingly, there was no announcement on the Laguna Boulevard and Highway 99 sign about this past weekend's Old Town Dickens Faire or the parade. Given the popularity of that event, perhaps Old Town merchants saw no need to pay for advertising on the board. Also of note, even though the Giant Pumpkin Festival was almost two months ago, the announcement for the event is still posted on the Laguna Boulevard sign as of Sunday, November 25. Although the festival has come and gone, perhaps the city is waiting for another space to be sold before it replaces the panel to save on removal and installation costs. If that is the case, and even if is not and the city has somehow forgotten dated events are populating the space and they are failing to follow their own rules, how relevant will a billboard be if the only thing passing pedestrians and motorists see are events that occurred two months ago? This does not even take into consideration the omnipotence of information in the palm of almost every resident that even in the best of circumstances renders up-to-date static message boards marginally useful. The expenditure of $81,000 may not be a budget-buster given the size of the city's annual budget. Nonetheless, if the city council repeats unnecessary $81,000 expenditures over and over, not to mention wasted staff time, it adds up quickly to hundreds of thousands and eventually millions of dollars. Taxpayers, and especially the Elk Grove City Council need to remember these wasteful boondoggles as they start considering the pursuit of a sales tax hike. Total waste of money. These billboards are aimed at drivers and you only have a few seconds to get the message across. By the time you have read the two top old repeats the two newer events below are lost. Billboards are just for a quick message and these are boring and will quickly be ignored. The one located at the corner of Elk Grove Blvd. and Big Horn can't even be seen by travelers headed north because of a tree blocking the view.